The most general equations for the velocity and acceleration of a point in space can be expressed in terms of angular velocity, angular acceleration, relative velocity, and relative acceleration. To illustrate, consider the rigid body shown in the figure below, which is experiencing a general state of motion. We wish to find the velocity and acceleration of point B, relative to the fixed (ground) reference frame XYZ. Note that xyz is attached to the rigid body and is moving with it. Also note that point B is not necessarily moving with the rigid body. In other words, point B could be changing position relative to the rigid body. The figure below illustrates this. where vrel is the velocity of point B relative to the rigid body, and arel is the acceleration of point B relative to the rigid body. Both vrel and arel are measured with respect to xyz. 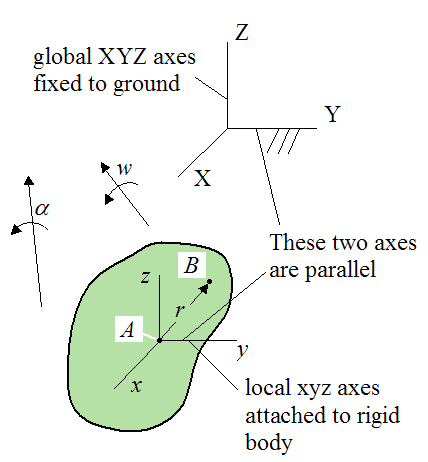 Note that the xyz axes is chosen as parallel to the XYZ axes. This is done because it allows for simple vector addition, where x is parallel to X, y is parallel to Y, and z is parallel to Z. In other words, for all points within a rigid body there is zero relative velocity and zero relative acceleration. 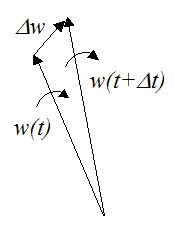 For two-dimensional dynamics problems, the angular acceleration vector is always pointing in the same direction as the angular velocity vector. 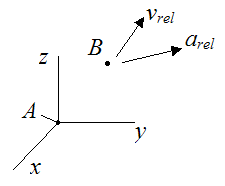 However, for three-dimensional dynamics problems these vectors might be pointing in different directions, as shown below. In two-dimensions, to find the angular acceleration you simply differentiate the magnitude of the angular velocity, with respect to time. In three-dimensions you have to account for the change in magnitude and direction of the angular velocity vector (since both might change with time), so this does complicate matters a bit. This is done by calculating the difference in the angular velocity vector over a very small time step Δt, where Δt→0. To illustrate, see the figure below. The above is an example of vector differentiation. To learn more about it click here. Note that the positive directions of the individual X, Y, Z axes are in the directions shown in the first figure. Similarly, the positive directions of the individual x, y, z axes are also in the directions shown in the first figure. This choice of sign convention is important when calculating the vector cross product in the equations for velocity and acceleration, given here. The mathematics of the vector cross product is based on this choice of sign convention, so it must be adhered to. This sign convention is common in physics textbooks. To see an example of a problem solved using the general equations for velocity and acceleration click here.